Although the challenge of starting a Campus-wide recycling program may seem challenging it is definitely obtainable. 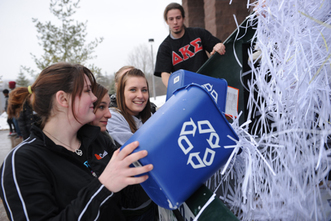 Universities and campuses are great institutions to begin recycling initiatives. Find like-minded individuals or a environmental organization on campus to being your recycling program! For a more in-depth look click below. Working with school representatives and fellow students, OnCampus ecoAmbassadors implement projects from EPA programs to help green their campuses, promote environmental awareness, and carry out the EPA's mission to protect human health and the environment. For more information on how you can be an EPA OnCampus ecoAmbassador at your school click here. ​Solar Decathlon 2015 - Missouri Schools "Shine"
November 2015 - Like the Olympic decathlon, the U.S. Department of Energy Solar Decathlon consists of 10 contests. These contests are designed to gauge how well the houses perform and how livable and affordable they are. Each contest is worth a maximum of 100 points, for a competition total of 1,000 points.